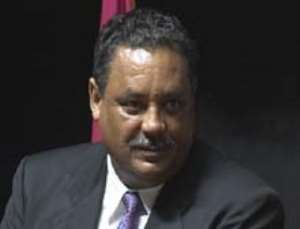 I am not involved - Jake Mr. Jake Obetsebi-Lamptey, Minister of Tourism and Beautification of the Capital City, has dismissed accusations by some executive members of the New Patriotic Party (NPP) in the Kpone-Katamanso Constituency, of attempting to impose a parliamentary candidate on the constituency. He said he had no intention of interfering in the process of electing a candidate for the constituency. Reacting to calls by some executive members, opinion leaders and council members of the party in the constituency to stop interfering in the affairs of the constituency and allow them to handle their own affairs, the minister, who doubles as the Greater Accra Regional Chairman, admitted proposing one Solomon Tetteh Appiah to stand for nomination but said this did not amount to an imposition. Speaking to The Chronicle on telephone he also admitted giving his car to Appiah, but denied that it was meant for political purpose. He said he had been working with the young man for sometime now and he knew his capabilities and believed he was the kind of person the party needed, hence his decision to give him his blessing. “I don't only do politics as a human being just as you don't do journalism alone for a living. I might have given my car to him but, certainly, not for political reasons,” he said. He rejected as unfounded a charge that he had agreed to pay ¢1million each to all the 37 polling station executives to ensure that they voted for Solo at the primaries. He said he did not believe in paying one's way to secure a position. “Maybe, those who are peddling this allegation are those who believe in paying money to get a post”, he added. At a meeting at Kpone last Sunday to discuss the progress of the party in the constituency, the executive members, opinion leaders, council members and ward executives accused the minister of doing everything, including bribing the polling station executives in the constituency, to ensure that Mr. Tetteh Appiah got the nod as the party's parliamentary candidate. They said this was contrary to the party's constitution, which debars executive members from openly supporting any candidate before the primaries. According to the party leaders they had petitioned the national headquarters about the behaviour of the regional chairman but so far nothing had been done about their complaint. They claimed that it was because Mr. Obetsebi-Lamptey wanted to use his position in the party to back Mr. Appiah that the party had still not been able to announce the date for the constituency primary. The Chronicle was informed that the regional chairman sometimes accompanied Mr. Appiah on his campaigns but this was denied by the aspirant, saying the minister had been going round the constituency to thank the people for voting for the party in the 2000 general election. He also said the minister had nothing to do with his nomination forms and the payment of his registration fee of ¢5,000,000. The Chronicle recently spotted Mr. Appiah driving a Sonyo-Muzzo 4- wheel- drive vehicle with registration number GT 3645D believed to belong to the minister. Mr. Appiah was one of the party executives who supported the minister when he declared his intention to represent the constituency about a year ago. He withdrew his candidature in the face of persistent criticisms against him from a section of the local executive members of the party, which attracted newspaper headlines.